Do you remember when all you had to do was grab your running shoes and head out the door you went for a four-mile run? Does just the thought of this make your knees hurt? Maybe you used to look forward to your regular runs, but now you either struggle through them (watching the clock constantly, eager for it to end) or perhaps you have given up all together because it’s not worth the pain and discomfort. Beginning in 1999, ChiRunning and ChiWalking have changed the way people move. Founder and president, Danny Dreyer combines his ultra marathoner running and coaching experience with his longtime study of Tai Chi to create safe and efficient running practice that works for virtually everyone. Through simple practices of cadence, focus, foot placement, body awareness, forward lean and core alignment, “ex” and current runners (and walkers) are able to enjoy pain and injury free running and walking ongoing. That’s Impossible! I Will Never Run Again! ChiRunning is not only based in experience and practice, Danny’s ChiRunning is backed by science too. In a 2012 study ChiRunning was found to be less stressful on the joints of the lower extremities than other running techniques. 4 Donald Lee “A Comparison of Lower Extremity Joint Work and Initial Loading Rates Among Four Different Running Styles” University of North ...continue Core control and body awareness helps runners move with more ease and less impact, which can lead to fewer injuries. When the body is in ideal alignment and your mind is focused on keeping on that way, running becomes more efficient and effortless and a lot easier to enjoy. ChiRunning’s emphasis on proper alignment through core control is a strong foundation for the practice and one of the main components against injures. Having a strong core protects the body from sustaining injury by minimizing load on the joints while distributing it more evenly throughout the body. 5 Leetun, D., T. et al., “Core Stability Measures as Risk Factors for Lower Extremity Injury in Athletes”, Medicine and Science in Sports and ...continue The cadence helps to set the rhythm of your stride, while foot placement and body awareness help to keep you mentally and physically sharp. Once you find your rhythm, ChiRunning becomes automatic. It flows. And you can always start your practice on a treadmill where you don’t have to worry about ditches and rocks. 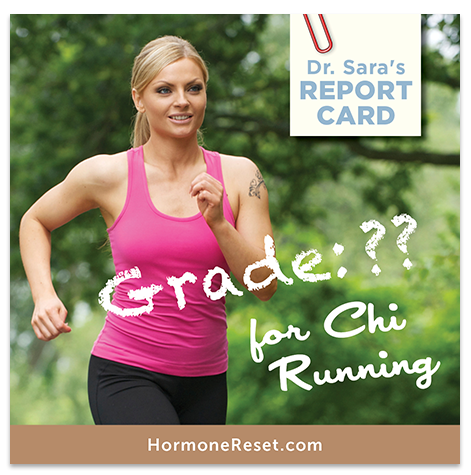 If you aren’t quite convinced about the running, then you can try ChiWalk-Run Program. The ChiWalk-Run Program offers a slow and progressive approach to introducing pain and injury free running into your program. You may also to mix the two and do ChiWalk-Run together either as intervals or on different days. And of course you can always stay with ChiWalking, if that suits your needs the best. While some people may think that walking isn’t ‘hard’ enough t make a difference, I beg to differ. Walking is one of the best exercises out there. In addition to being easy on the joints, it also reduces cardiovascular disease and lowers overall mortality rate. 6 Manson, J., E. et al., “Walking Compared with Vigorous Exercise for Prevention of Cardiovascular events in Women”, New England Journal of ...continue, 7 Hakim, A., A. “Effects of Walking on Mortality Among Nonsmoking Retired Men,” New England Journal of Medicine 338 (1998): 94-99, accessed on ...continue Its accessible and free AND you get to check out cool neighborhoods and nature trails as an added bonus! While ChiRunning and ChiWalking work wonders, unfortunately this is not a 4-minute fix. This practice requires concentration and focus. There are some basic techniques that one must learn in order to perform Chi Walking and ChiRunning effectively. Here’s where you may need to take notes. While it may seem like a lot at first, it will become easier with regular and consistent practice. Warm Up-Make sure your muscles, tendons, ligaments and joints are warmed up before beginning any exercise program. Maintain Good Posture-Efficiency of running is directly related to quality of posture; poor posture weakens your core muscles and restricts blood flow and oxygen to brain and muscles. Maintain Good Leg Motion-Over striding and incorrect knee angle can cause injuries and poor circulation. Landing with your feet under you and keeping your knee at a 90 degree angle is ideal. Cadence- long strides cause our bodies to work harder. Establish and keep a regular cadence of about 85-90 strides per minute. ChiRunners often use a metronome to help maintain their cadence. Body Sensing-In order to be in touch with your body, you must listen to it. Know where you are internally and externally. Mental Focus-You will work to train your brain to re-educate the body to run more efficiently. Eventually it becomes a part of muscle memory and, needless to say, more effortless and enjoyable. But you need to practice! Body Connection-The upper and lower body assume equal amounts of work between the two. Balancing the load so that one doesn’t have to overcompensate (and overtire) for the other. Instead upper and lower are working in unison. Belly breathing-An important part of the Chi practice includes belly breathing. Belly breathing involves filling up the lungs such that the abdomen expands rather than just the upper chest. This allows for increase oxygen consumption and absorption, which boosts metabolism. Limbs-It’s important to have a good bend in the joints -forearm and shin should be parallel to ground mid-swing, and relaxed. I know, I know. It sounds like a lot to learn. When we try new things, it’s going to feel a little awkward at first. Your body has become accustomed to its (familiar) physical and mental habits. ChiRunning and Walking will challenge those patterns. But don’t worry. You can do this slowly, one change at a time. If you look up Danny Dreyer ChiRunning on You Tube you can watch a video of the how the technique is performed, which will help you begin to visualize it. And again, take it one step at a time. ChiRunning and ChiWalking get high marks. 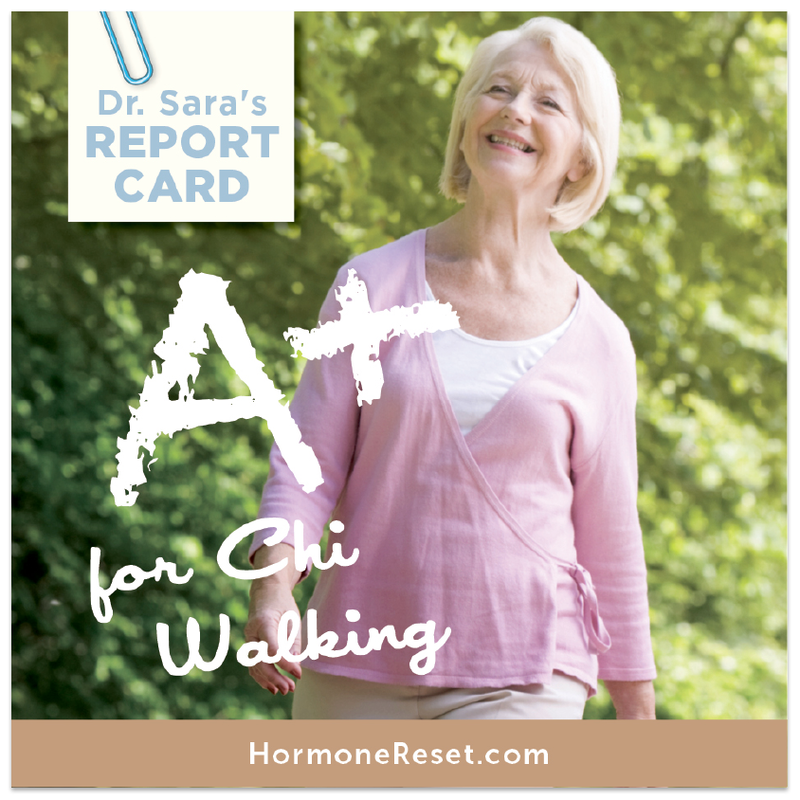 ChiWalking is safe for everyone, accessible, free, and effective—so I give it an A+. ChiRunning is more complicated to execute properly, and I suggest training with one of Danny Dreyer’s certified coaches. Because it’s difficult to nail the form, I give ChiRunning an A-. 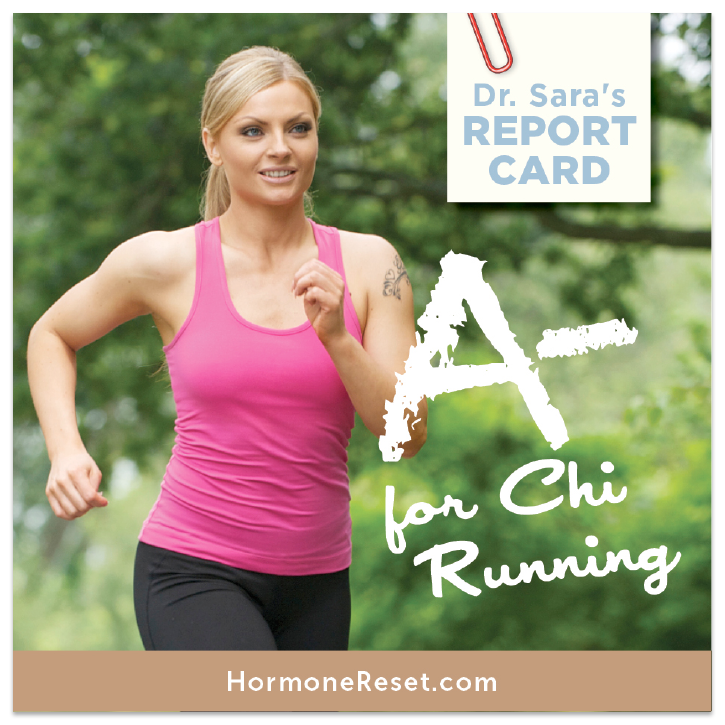 You can learn more about ChiRunning and ChiWalking in my new book, The Hormone Reset Diet. Check it out, be patient, and let us know what you think! 5. ↑ Leetun, D., T. et al., “Core Stability Measures as Risk Factors for Lower Extremity Injury in Athletes”, Medicine and Science in Sports and Exercise 36 (2004): 926-934, accessed March 23, 2015. http://www.ncbi.nlm.nih.gov/pubmed/15179160.